Video has become a pivotal strategy for sharing content with publisher audiences. It educates, entertains, inspires action, and converts viewers to consumers. And because it plays on a growing number of accessible platforms and affordable devices, viewers are hitting the play button. At the same time, the tools and equipment for creating effective videos have come a long way. They are no longer relegated to the realm of expensive marketing agencies. All you need to create and edit is within your reach — affordable and user friendly. If you’ve been considering producing videos in-house, here’s how to get started. Before you start shooting footage, you have a host of critical decisions to make. Who is the intended audience? As with any piece of content, knowing your audience will tell you what their base of knowledge and interest is and help you determine the right material and tone for your video. What is your objective? Is it to educate, entertain, or to call viewers to action? Know what you want to get out of this effort so you can effectively tailor the content and, later, gauge its success. Is your video a standalone piece or part of a series? This decision impacts the naming, length, structure, and tenor of your video. Arguably, the most engaging use of video for a publisher is the series structure: short videos (about 2-3 minutes long) presenting theme-based content in periodic episodes. Pique viewer’s interest and get them coming back for more. How will you share your video? This decision impacts how you save your video files and where you have them hosted. If you intend to post your video on social media, hoping it will be shared and thus broaden your audience, you’ll upload your video file (in MP4 or Quicktime format) to the social media site, which will host the file. If you plan to post your video to a subscriber-only area of your website and tout it as premium content, you’ll have to employ a video hosting and play platform like YouTube or Vimeo. YouTube requires users to go to its platform to view the file; Vimeo videos can be embedded to play within your own site. What is your budget? As with most projects, budget is key. In this case, there’s a vast difference between producing a video in-house with inside talent and fairly basic production values — and producing, say, videos on-location with hired talent and complex animation. Answering the previous questions and pricing out equipment will help you determine a working budget. Casting. Who on your staff has that magic combination of subject matter expertise and ease in front of the camera? Tap THAT person as the host of your series. Personality is a key ingredient for generating viewership. Scripting. The nature of your series and the general comfort level of your speaker(s) will determine the level of scripting you need. Just as in a live presentation, well-rehearsed talking points often yield a better final product than a strict script. That said, if you have multiple speakers, a tighter script may be necessary so that each person knows when to speak and what to say. Storyboarding. 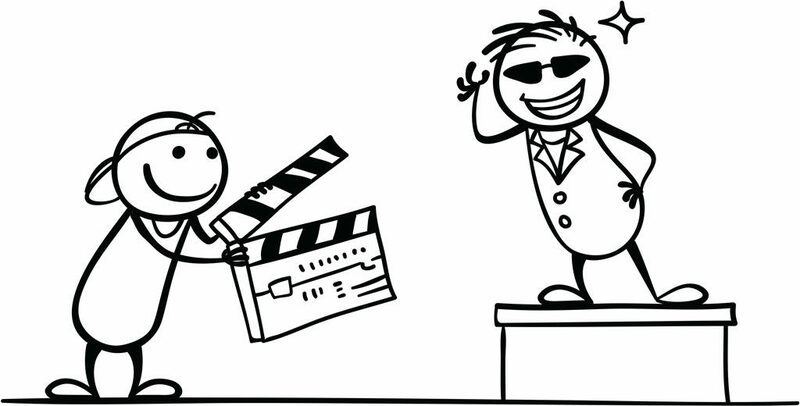 An optional or additional method for plotting out your video is to storyboard it. While this process might be overkill for an interview-style or simple, single-speaker video, it can be indispensable for a more complex one. This is simply a series of sketches (done electronically or with old-fashioned pencil and paper) that plots the intended sequence of your video. Location. If you’re working on a budget, leverage the benefits of using one consistent location for filming. In such a controlled environment, you can dial in the variables of lighting and sound such that you don’t have to recreate the wheel for each subsequent shoot. Equipment. For video to be effective, the viewer needs to see and hear your story without being distracted by production details. This means you need adequate lighting, a reliable camera with a quality lens, and good sound gear. Location, gear, and speakers are ready to go, but on the day of the shoot there are some important things to pay attention to before you start recording. Set-Up Time. Be sure you allow yourself at least an hour to set up your camera(s), lights, and gear. It always takes longer than you think it will to get the power sources sorted, manage any sound issues (are there phones ringing in the background? ), and set the cameras up for the best possible framing. Gear Check. Just because it all worked perfectly yesterday doesn’t mean it will today. Test all the functions of your gear before you start filming. Can you hear clearly and without interference on all your audio sources? Are your data cards formatted and ready to record? Monitor all throughout the shoot to be sure you’re capturing. Recording. Press ‘Record’ before you start the scene, keep rolling through mistakes, and don’t stop until after it’s over. The unguarded moments can be the best. Directing. Footage is most impactful when those in front of the camera are comfortable. A glass of water for your speaker, chit-chat as things get rolling, or some nice words about his or her expertise are details that can make a difference. If you find it takes a while for someone to relax on camera, don’t be afraid to repeat some of the early material to capture optional takes. Once you have shot your footage and have moved the data to your computer drives (and backed it up), it’s time to edit for a polished presentation. The most popular and user-friendly video editing programs are iMovie, Adobe Premiere Pro, and Final Cut Pro. In terms of cost, iMovie is the least expensive (most Macs come with it; similar programs are available for PC); Adobe Premiere Pro is part of the subscription-based Adobe Creative Cloud (starting at $20.99/month); and Final Cut Pro is sold separately ($299.99). Premiere and Final Cut Pro are likely to yield the most refined end product. I use Adobe Premiere because it can handle editing the full range of video types from simple to complex. It also includes color correction and sound mixing, so I can avoid integrating additional programs for these essential functions. Since Premiere is part of the Adobe Creative Cloud, which we use, it can easily bridge to After Effects and other useful Adobe programs. Most importantly, you can pass files back and forth on different computers. If I have edited a video and my team needs to do a graphics pass, I can send them the Premiere file. As long as they have the source material, Premiere will pull up the project and populate the media. No worries about different file formats or software versions. Lynda.com, offer well-regarded classes and single-topic video segments. Once you have edited your video and sound (an article topic unto itself), you’ll want to consider how you’ll open and close your video or series. You can do something as simple as an opening graphic featuring branded colors, your logo, and a title. The same card, without the title, can close the piece. To get more advanced, you can create or outsource an animation clip, which can go a long way toward branding your series. Fiverr.com is an excellent resource for finding qualified freelancers to do specialized projects like animation. Finally, you’ll need music. Often a video series will have a few seconds of instrumental music at the top and tail to bookend each segment. This plays over the opening and closing screens (or animation), with a few extra seconds fading in and out to create a soft audio transition. Or, you can play a music bed throughout your video. There’s no right or wrong here; it’s simply a question of branding. Stock houses, such as Pond5, Getty Images, and SoundCloud are great sources for affordable music from a variety of genres. When the picture is cut and the sound is clean, the final step is exporting. Depending on where you plan to play your video, you will choose a different export setting. “H.264” is usually the best file format for posting to a website, and “MP4” for social channels. Check in with your webmaster or hosting platform. If you plan to play the video on a large screen, perhaps in a conference room, you’ll choose a higher-resolution file format. Editing programs offer a variety of user-friendly output formats. Kate Super is an award-winning documentary and media producer. She is also founder and executive producer at Sidford House Media, a video and media production company. Connect via super@pagesthemagazine.com. Spring 2018 Please Don’t JUST REDESIGN Your Website. Please!